Cruising Guides and Charts are included on each boat. 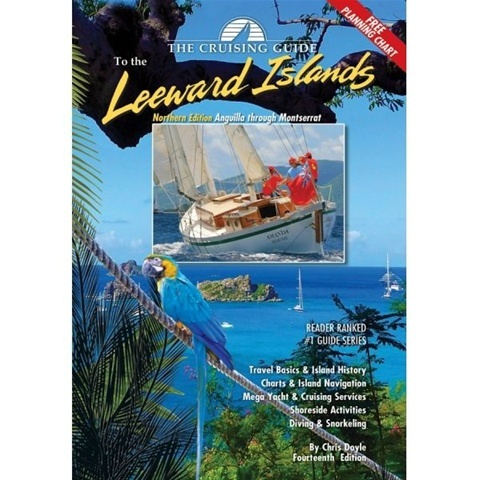 This 14th edition (2016-2017) has been split into two guides, The Cruising Guide to the Northern Leeward Islands and The Cruising Guide to the Southern Leeward Islands. The Cruising Guide to the Northern Leeward Islands covers the islands of Anguilla, St. Martin & Sint Maarten, St. Barts, Saba, Statia, St. Kitts, Nevis, Redonda, and Montserrat. These guides are an essential tool for all cruisers sailing this region. Chris Doyle spends months sailing these islands to update each edition. Included are over one hundred up-to-date color sketch charts, full color aerial photos of most anchorages, island pictures, and detailed shoreside information covering services, restaurants, provisioning, travel. Available from Amazon.com from $29.95.